Floor Is Lava makes games and other fun things. Reach us by email at lava@floor.is or on Twitter at @floor_is_lava. Take a historical walking tour of your neighborhood, learning hidden facts that have never been discovered — because they’re made up on the spot. IndieCade 2017 Official Selection. A fun and frantic relay race for bus drivers of all ages: pick up imaginary passengers and drop them off at the right stops. Game for SF Transit Week 2017. A procedural puzzle generator. 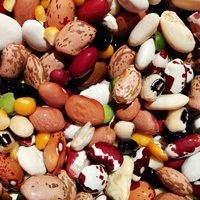 Solve random word-find puzzles, forever. 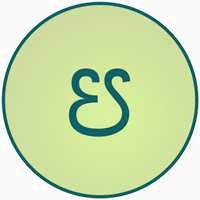 A Twitter bot that posts illuminated Unicode characters. 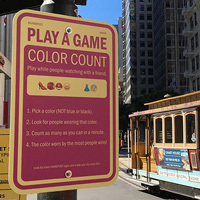 A system of street signs presenting simple games that anyone can play while walking around the city. Installation for Market Street Prototyping Festival 2016. 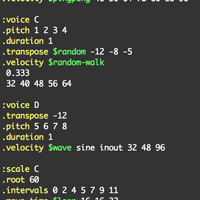 A procedural MIDI sequencer controlled by a custom scripting language. A suite of short games to be played in breaks between talks. A lively team sport for people who don't need all the running around. Selected Best New Sport at Come Out & Play NYC 2014. 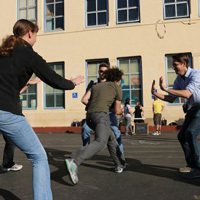 A quick and chaotic playground game for crowds that can be played anywhere that aggressive miming is called for. We posted our 2017 Year in Review report. Stay tuned for more real-world games in the coming year! We ran two games of Secret Histories at BigBadCon in Walnut Creek, exploring the complex histories of hinges and the arcane. We showed Secret Histories at IndieCade 2017 as part of their Night Games exhibition. Multiple groups explored Little Tokyo in Downtown LA and uncovered histories of zombies, ghosts, and more. 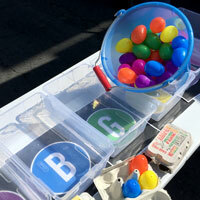 We played a new game, Mini Bus Madness, with SF Transit Riders to celebrate Transit Week at Sunday Streets Excelsior. 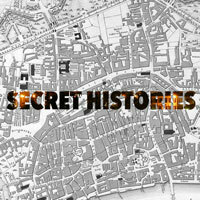 Secret Histories was announced as an Official Selection for IndieCade 2017. We've posted a brief report on our 2016 Year in Review. A lot happened! Come Out & Play SF announces expanded programming for its 2016 season, including six days of free festival events and nine special ticketed events. Floor Is Lava's Gamepost project has been selected to be a part of this year's Market Street Prototyping Festival. Josh gave a lecture at the CSU East Bay Winter Game Jam on "Hybrid Forms of Play". Josh presented some Games For An Evening Of Conversation as part of Come Out & Play SF 2015. Stepball made an encore appearance at Come Out & Play NYC. Good times were had by all. We're now working out of the Gamenest, a coworking and event space for indie game devs in San Francisco. Stepball has been named an Official Selection for IndieCade 2014. It will be run at the festival the weekend of October 9-12. 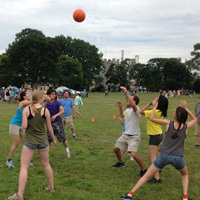 Stepball was featured at the Come Out & Play festival on Governor's Island in New York, where it won the Best Sport award. Osmo, an iPad accessory that enables tabletop computer vision-based gameplay, is available for preorder, shipping in Q3 of this year. The system features Newton, with design and development by Josh. Josh gave a talk at IndieCade East, on learning to make games from magazines in the microcomputer era. The slides are posted on SlideShare. Mime Boxing was featured at Come Out and Play SF 2013 over the weekend. The SF Bay Guardian describes the game as "a rowdy free-for-all of imaginary walls and temporary alliances," which is better than anything I could come up with. Solar Surfing in Opti Space is available in the App Store for iPad and iPhone. Make beautiful music while flying your space pod around mysterious suns. Voyage of the Starship Lexicon was featured at Casual Connect SF as part of the Indie Prize Showcase. Good times were had by all. A new version of Voyage of the Starship Lexicon is now available for iPhone and iPad in the iTunes Store. This version features a new puzzle mode, and has extra levels available as in-app purchases. Go forth and make cool words! Onnecheo is now out on Kongregate. Connect the dots to make shapes and solve puzzles. Low Rollr is now available for Sifteo Cubes. Roll your cubes to score big points, or take special actions to mess with your opponents. If you're at GDC this week, you can play Low Rollr at Sifteo's booth. Voyage of the Starship Lexicon is available on the Amazon Appstore for Kindle Fire. 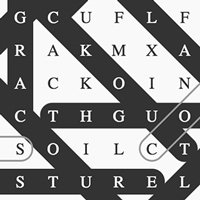 Make words in space by rotating tiles in the grid. Tour the solar system and challenge yourself on different planets that offer a wide variety of gameplay options. Flaar Amaris is available on the App Store for iPhone and iPad. Flaar Amaris is a simple musical toy: tap the screen to make flowers bloom and chime. It is (hopefully) the first in a series. The new Sifteo Cubes are out and shipping. Cube Buddies comes with the system. Good times were had by all at IndieCade, and Chroma Shuffle was well received. Josh made a video about the game for the festival. Sifteo announces its next-gen Cubes, featuring Cube Buddies. Chroma Shuffle is a finalist at IndieCade 2012!